How Hot is the Cremation Oven? 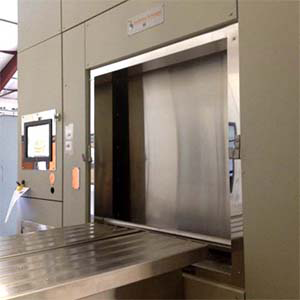 The cremation oven, also called the cremation chamber or retort, operates at an optimum temperature range of 1,400 to 1,800 degrees Fahrenheit. The heat typically comes from natural gas or propane. Most modern cremation chambers are constructed of fire resistant bricks on the interior of the chamber ceiling and walls. Specially constructed masonry materials line the bottom due to its exposure to the most extreme temperatures. The walls of the chamber are approximately 6-inches thick. Depending on the model of the oven or chamber, the door opens manually or mechanically when operating from a control panel. To ensure the dignity of the deceased and to comply with Health & Safety Code statutes, the deceased is cremated in a container before the cremation. They are typically referred to as cremation containers or alternative containers. The requirements of the container are specified by the Texas Health and Safety Code Sec. 716.151. The family’s wishes and the size of the deceased will determine the type of container used. Most of the cremations done by Local Cremation and Funerals are done in a standard corrugated box. However, wooden containers and cremation caskets are used as well. Regardless of the material, the purpose is the same – provide a container that breaks down completely without leaving residue at the end of the cremation. The make-up of the human body is primarily water, carbon, and bone. During the cremation, the organic materials are oxidized and then turned into vapor. This includes the organs, skin, tissue, muscle, etc.) As these elements break down, the gasses and water are removed through the cremation oven’s exhaust chamber. When the cremation is complete, what is normally left is are bone fragments and any non-natural materials. Common examples are dental work, implants and artificial joints or bones. When jewelry or other objects are left with the deceased, what remains of them is typically unrecognizable and not salvageable. After a cooling period, the non-organic materials are removed. Then the remaining bone fragments go through a process to break them down to a texture similar to course sand. They are then placed in a heavy bag that is sealed and then placed inside a temporary container or decorative urn purchased by the family. If you have any other direct questions about cremation, please contact us and one of our funeral directors can assist you. While we will consistently be compassionate and diplomatic, you can always expect honest answers from myself and our other dedicated professionals.